[map] [street view] North of the Harper community along FL-87. On River Road, south of the five-way with Avery Olsen and Five Forks Roads. [Image] Image of the RDS text display from a Mazda sedan's radio, showing the PS (station name), PTY (format) and Radio Text fields. 95.7 was originally allocated to East Brewton, with the WAFN call letters which came from 104.1. The allocation barely fit - the station was site restricted to an area somewhat north of Brewton/East Brewton, where the signal fell upon mostly woodland animals and the occasional lost hunter. Brewton really couldn't support another station, already hosting WEBJ AM and WKNU FM. It had a 3 year stint with the AAA-tinged WZEW calls before becoming WGCX. The station later was reallocated to Navarre, halfway between Ft. Walton Beach and Pensacola, Florida, with contemporary Christian music. The station was co-owned with WVTJ 610 (all-preachers), WNVY 1090 (black gospel) and WZNO 1230 (southern gospel), through the Pensacola Christian Radio organization. The station dropped longtime WGCX calls for WKFP in August 2009. 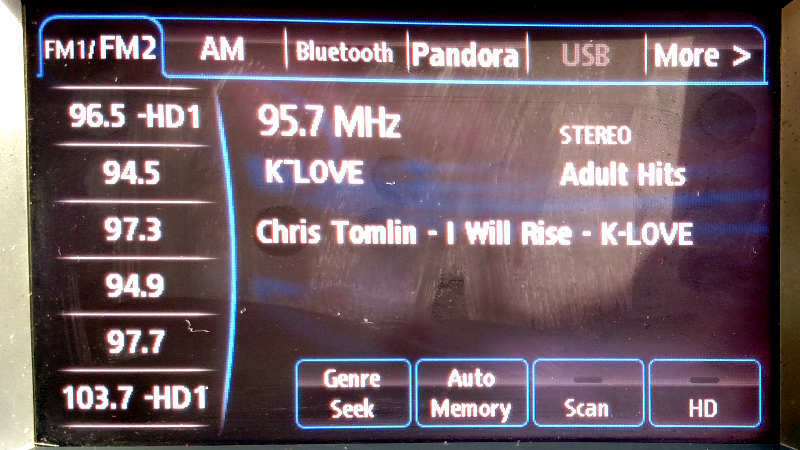 As a locally programming religious station, the slogan was "Praise 95.7" but at some point after the call letters changed they opted to pick up the religious K-Love network. In October 2013 it was announced that Pensacola Christian Radio (as 550 AM, Inc.) had sold the station to K-Love parent Educational Media Foundation (EMF) for $1.75 million. The station converted to noncommercial operation, but otherwise remained in the same format. In May 2015 the station received a construction permit to raise antenna height from 282 to 328 feet, adding only a few hundred feet of additional coverage in any one direction. It also included a slight correction to the transmitter site's coordinates. In July of 2015 the calls changed from WKFP to WPLV.